This post is supposed to contain mostly up-to-date lists of the raw samples that are still missing from RPU. Please periodically visit this thread, spread the link to this thread, spread the word, and help out! If the camera can produce multiple interesting raw samples (see main page or RPU for details), we need the full set of the samples to have the same content. So even if part of the samples is already present, please, upload the full set! While we already do have the samples for the cameras in this list, they need to be replaced. Please provide the full sample set for each camera in the list. Specifically, looking for the camera that still produces ARW v1 raws, with the biggest sensor. There are many cameras out there capable of producing raw files. We have a list of known cameras with no samples. That list is auto-generated, and it is most likely incomplete. Even if you do not see your camera in the list, please still do manuall check that we have a full sample set under Creative Commons Zero (CC0). Yes, some cameras are marketed under several different names. We can not know that the name is the one and only difference, so we want all the samples regardless. We have many raw samples that were not licensed as freely as we would like. 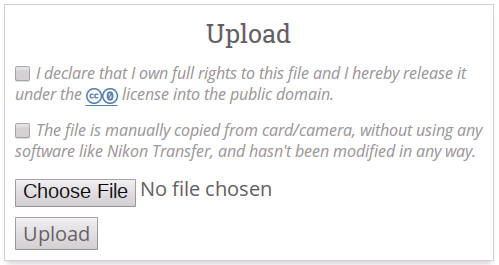 Ideally we are looking for images that have been released under Creative Commons Zero (CC0). We have a list of cameras with non-CC0 sample, so if you happen to have one of the cameras listed there please consider contributing the full raw sample set for us! Rawtherapee can read my .NEF but not Darktable for some photo. Raw Files opened in DT start "way off"
should I upload files produced by unofficial firmware, eg. nikonhacker? it has a different layout and black level compared to the vanilla fw files. edit: uploaded all D800 crop factors, aspect ratios, bit depths and compressions and special cases I could think of. Thanks! Did not go through them yet, but that is a lot of samples. should I upload files produced by unofficial firmware, eg. nikonhacker? No, i don’t think so. For NIKON D5100 these samples already exists, i’m not aware of any need to have them for other cameras. I uploaded one sample from the hacked firmware as it has different layout than the vanilla firmware files. D5100’s hacked firmware produces identical files to the vanilla firmware, except for the black level and lack of spatial filtering and colour channel scaling. I think you’ll find usable Pentax 645Z raw samples here. From this review, you’ll find an archive with D3x and 645D raw samples. The samples don’t seem to be explicitly licensed. We can’t just go around, steal samples and upload them. Possibly, even if they are already under CC0. Note that in the list of missing samples you list the Panasonic TS110 / TZ110 but this is the same camera as the TS100 / TZ100 for which files are already included. is the one and only difference, so that is irrelevant, and we want the samples regardless. just one sample out of 4. Sorry I probably confused things a bit as the designations are zs100/110 (not ts) and tz100/110. However I have the TZ100 for which you already have a full set of samples for so unfortunately I can’t help with the missing ones. @LebedevRI Sorry, I overlooked the end of the post. I’ve sent a mail to the site maintainer and will probably open a thread in their forum. Sorry, I overlooked the end of the post. Re Pentax - please do note that we want both the PEF and DNG. @LebedevRI Pentaxforums files can’t be used, as told by email, but thread opened here. @heckflosse is a user of this forum and can check replies too. We absolutely do want the PEF+DNG sets, but i’m not too sure about crops. I have a Nikon D800. I always shoot with FX Image Area (36x24mm), but it has 3 other settings: 30x20mm, 24x16mm (DX) and 30x24 (5:4). I don’t suppose many photographers use those settings. Your raw sample library doesn’t seem to have samples with those image areas. Do you want them? Shooting at the 4 settings is no problem, but uploading will take an age. The absolutely full sample set for that camera was uploaded. I just did not decide what to do with these crop raws. All what we need is listed on the RPU in the right column.